Home - Alpine Glass Inc. Welcome To Alpine Glass Inc.
We service Calgary and the surrounding areas, providing a full range of glass, architectural metals, automatic doors and many other services in the Commercial Construction Industry. Our team of experienced Journeymen & Apprentices will ensure a high quality installation of our products. We are constantly growing and adapting to the new glazing systems and technologies – keeping current with all our training. We take great pride in our work – contact us for your next project. Alpine Glass was originally founded in 1962 and has grown & evolved over the past 55 years. We are a thriving company with unlimited growth potential with an enviable track record in the Calgary construction scene. Our business is construction and we understand its complexities, we recognize the importance of deadlines and honour our commitments. Over the years, we have earned a solid reputation with our customers not only for high quality products but also for servicing what we sell. We offer 24-hour emergency service on all of our products. 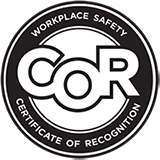 Alpine Glass Inc. has consistently led the Calgary construction industry being awarded best “Safety Performance” by Occupation Health and Safety. Our employees are committed to safety. Not just our own well being, public safety as well. © 2019 Alpine Glass Inc..